We can offer a variety of services that other repair facilities cannot. We are constantly upgrading our tools, equipment and technical training to stay on the cutting edge of auto repair. Receive 10% off total labor charge, for a limited time. Cannot be combined with any other offer. Cannot be applied to sublet labor or fleet rates. Other restrictions may apply. Coupon Expires 4/30/19. "If you're looking for an honest auto shop this is the place. Working on new and old imports today is an art and the technicians at four car garage have mastered their craft. So instead of going to a high priced dealer that keeps your car for extended periods of time go to four car garage and get quick, decisive and friendly service." If you are looking for a top quality, dependable auto repair shop... you found us. Don't just take our word for it; we have been an accredited member, in good standing, with the Better Business Bureau since 1980. Many of our first-time customers have become long-term customers, consistently choosing Four Car Garage for all their auto repair and maintenance needs. 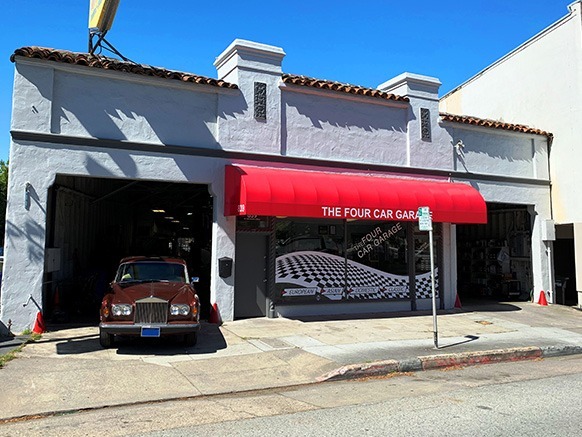 Gary and his wife Diane acquired The Four Car Garage in 1983, and it has been family owned and truly family operated ever since. Our ASE Certified technicians use the latest technology and diagnostics equipment to work on the newest cars and the knowledge and patience to restore or maintain your classic. We are committed to keeping you safe and to keeping your vehicle in top running condition. You will find our knowledgeable service advisers and ASE certified technicians willing to listen to your concerns, diagnose the problem and offer solutions. We understand that people have budgets and we will work with you to prioritize necessary repairs and whenever possible seek out options for new and/or rebuilt components. Would you like A Loaner Car? We've had loaner cars for quite some time now, but we still have many customers who aren't aware of this. Our loaner cars are available for a nominal fee of $15.00 and must be reserved in advance. So if having a loaner car would help you achieve your daily activities, and therefore make it easier for you to keep up with your own car's maintenance, then please request one when you request your appointment. We use the latest automotive diagnostic technology to provide you with high-quality service, and quick turnaround. In fact, our parts department carries a large inventory of in stock parts. Do you have a classic European car in need of restoration or just routine maintenance? You've come to the right place. We offer many preventive maintenance options. It's the convenient way to keep your car healthy and in top condition.